IK Multimedia and Course Technology PTR announced the release of the official mixing and mastering guide for the T-RackS software, "Mixing and Mastering with T-RackS, The Official Guide", written by producer and audio engineer Bobby Owsinski. IK Multimedia has updated T-RackS to v3.1.2. 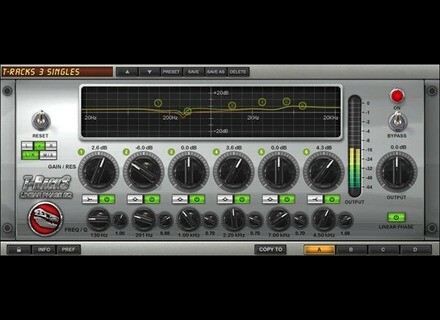 audioMIDI.com and IK Multimedia bring you a "two-for-one" bargain: T-RackS 3 Classic EQ & Metering Suite plug-ins. IK Multimedia has announced the launch of the "Summer Group Mix Promotion" where musicians, engineers and producers can get up to three free T-RackS 3 Singles plug-ins for the price of one. IK Multimedia has announced that users may now purchase and download T-RackS 3 Singles, individual processor plug-in modules from the T-RackS 3 Deluxe mastering and mixing suite. IK Multimedia has announced that users will soon be able to purchase and download individual processor modules from the T-RackS 3 Deluxe mixing and mastering suite. IK Multimedia hasannounced the worldwide tour of T-RackS 3 Master Classes, a series of free clinics and workshops designed to give musicians the knowledge and tools they need to discover their product.